FOR Philo and Origen, Pharaoh symbolizes what St. Paul later called the carnal mind, i.e., that which strives within our soul against spiritual mindedness (see e.g., Rom.7:14−25, 8:1−7; Galatians 5:17). Our souls are weighed down and oppressed by the demands of worldly desires and concerns. Our exodus to the Promised Land is accomplished by practice of virtue and elevation of mind, heart and spirit. Philo associates the mortar and bricks in Exodus 1:14 with the similar figure in the Tower of Babel story, producing an interesting phenomenological analysis of human thought in the fallen condition of folly, hubris and impiousness. XVIII. (83) Now the wicked man wishes to display his unity of voice and speech through fellowship in unjust deeds rather than in actual words, and therefore begins to build a city and a tower which will serve for the hold of vice, as a citadel for a despot. He exhorts all those who form his company to take their share in the work, but first to prepare the suitable material. (84) “Come,” he says, “let us make bricks and bake them with fire” [Gen. 11: 3]. The meaning of this is as follows. At present we have all the contents of the soul in inextricable confusion, so that no clear form of any particular kind is discernible. (85) Our right course is to take the passion and vice, which at present is a substance devoid of form and quality, and divide it by continuous analysis into the proper categories and the subdivisions in regular descending order till we reach the ultimate; thus we shall obtain both a clearer apprehension of them and that experienced use and enjoyment which is calculated to multiply our pleasure and delight. (86) Forward then, come as senators to the council-hall of the soul, all you reasonings which are ranged together for the destruction of righteousness and every virtue, and let us carefully consider how our attack may succeed. (87) The firmest foundations for such success will be to give form to the formless by assigning them definite shapes and figures and to distinguish them in each case by separate limitations, not with the uncertain equilibrium of the halting, but firmly planted, assimilated to the nature of the square — that most stable of figures — and thus rooted brick-like in unwavering equilibrium they will form a secure support for the superstructure. XIX. (88) Every mind that sets itself up against God, the mind which we call “King of Egypt,” that is of the body, proves to be a maker of such structures. For Moses describes Pharaoh as rejoicing in buildings constructed of brick. (89) This is natural, for when the workman has taken the two substances of earth and water, one solid and the other liquid, but both in the process of dissolution or destruction, and by mixing them has produced a third on the boundary line between the two, called clay, he divides it up into portions and without interruption gives each of the sections its proper shape. He wishes thus to make them firmer and more manageable since this, he knows, is the easiest way to secure the completion of the building. (90) This process is copied by the naturally depraved, when they first mix the unreasoning and exuberant impulses of passion with the gravest vices, and then divide the mixture into its kinds, sense into sight and hearing, and again into taste and smell and touch; passion into pleasure and lust, and fear and grief; vices in general into folly, profligacy, cowardice, injustice, and the other members of that fraternity and family — the materials which moulded and shaped, to the misery and sorrow of their builders, will form the fort which towers aloft to menace the soul. Source: Colson, F. H.; Whitaker, G. H. (Trs.). Philo: On the Confusion of Tongues. In: Philo (10 volumes and 2 supplements), vol. 4. Loeb Classical Library. L261. Harvard, 1932. (pp. 55−59). First of all I wish to investigate who the king [i.e., pharaoh] is in Egypt who knows Joseph and who he is who does not know him. For while the king who knew Joseph reigned, the sons of Israel are not reported to have been afflicted nor exhausted “by mud and brick.” [Ex 1.14] … But when the other king — who did not know Joseph — arose and began to reign, then all these things are reported to have happened. Let us see, therefore, who that other king is. As long as it remembers these things in Egypt — that is in our flesh — our spirit holds the kingdom with justice and does not exhaust the sons of Israel, whom we said above to be the rational senses or virtues of the soul, “by mud and brick,” nor does it weaken them with earthly cares and troubles. These words were not written to instruct us in history, nor must we think that the divine books narrate the acts of the Egyptians. What has been written “has been written for our instruction and admonition.” [1 Cor 10.11] Its purpose is that you, who hear these words, who perhaps have already received the grace of baptism and have been numbered among the sons of Israel and received God as king in yourself and later you wish to turn away and do the works of the world, to do deeds of the earth and muddy services, may know and recognize that “another king has arisen in you who knows not Joseph,” [Ex 1.8] a king of Egypt, and that he is compelling you to his works and is making you labor in bricks and mud for himself. It is this king of Egypt who leads you by whips and blows to worldly works with magistrates and supervisors put over you that you may build cities for him. It is he who makes you run about through the world to disturb the elements of sea and earth for lust. It is he who makes you agitate the forum with lawsuits and weary your neighbors with altercations for a little piece of land, to say nothing about lying in ambush for chastity, to deceive innocence, to commit foul things at home, cruel things abroad, shameful things within your conscience. When, therefore, you see yourself acting in these ways, know that you are a soldier for the king of Egypt, which is to be led by the spirit of this world.. Source: Origen, Homilies on Exodus 1.5 (Tr. Ronald Heine, Origen: Homilies on Genesis and Exodus, Father of the Church 71, pp. 233 f., 1982) Note: edited slightly by JU. ONE of the finest Patristic works on Psalms is the letter of St. Athanasius of Alexandria to his friend, Marcellinus, Ad Marcellinum. 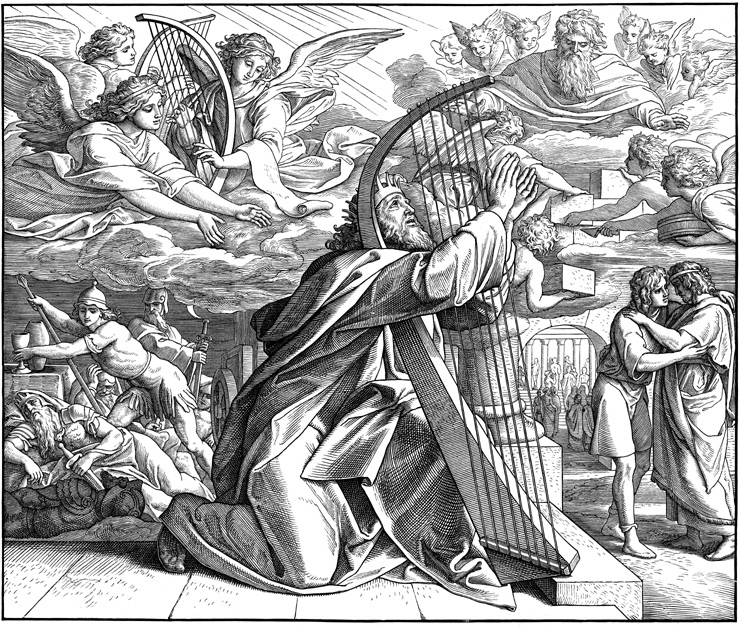 Ostensibly relaying what he learned from an “old man” — perhaps a saintly desert ascetic — St. Athanasius exhorts us not only to read the Psalms, but to read them “intelligently.” He also affirms the benefits of singing the Psalms, by which means a uniting and harmonization all one’s faculties and powers occurs. The letter is not long, and all who are drawn to Psalms and wish to profit from them are encouraged to read it in its entirety (links in Bibliography). Some passages of special interest are supplied below. (Note: square brackets indicate sections as enumerated in the Migne edition; translation is by Anonymous 1953/1998). Elowsky, Joel C. (tr. ), Athanasius: Letter to Marcellinus on the Psalms. New Haven, CT: ICCS Press, 2017. Gregg, Robert C. (tr.). Athanasius: The Life of Antony and the Letter to Marcellinus, Paulist Press, 1980. (pp. 101−129). Epistula ad Marcellinum de interpretatione Psalmorum. [Greek text, digital]. Kolbet, Paul R. Athanasius, the Psalms, and the Reformation of the Self. The Harvard Theological Review, vol. 99, no. 1, 2006, pp. 85–101. IGHT THOUGHTS by Edward Young (1683—1765) might easily be the greatest English literary work of the last 300 years. A masterpiece judged by any standard, it rivals the works of Shakespeare and Milton and exceeds those of Young’s better-known contemporary, Pope. It is testimony to the infidelity of the modern age the neglect into which this great work has fallen. Its topics? Ones of greatest moment and timeless concern: Life, Death, Eternity, heaven-sent Philosophy, and the true meaning of the Delphic maxim, Know Thyself. Young published Night Thoughts in nine installments or Nights. The present new edition, with an introduction and notes for modern readers, supplies the first four Nights — originally conceived by Young as a complete work, and which supply the work’s main lines of thought. For a limited time an advance copy of the new edition is available for free here. The topic, the motives, and the poetic skill of Young are magnificent. The work is inspired, and one of the great jewels of English literature, not to be missed. That thou mayest regard discretion, and that thy lips may keep knowledge. Who is the strange woman mentioned in Proverbs and elsewhere in the Old Testament? A search of the web reveals few convincing efforts to answer this question. It seems like this ought to be discussed somewhere online, so we should make the effort to do so here. It seems clear these verses represent something beyond the literal advice of a father to his son to stay away from prostitutes. That’s certainly good advice, but is a topic more suitable for an instruction manual for fathers than for inspired Holy Scripture. The strange woman here appears to relate to some realm or dimension of ones own mental experience. In broad terms, she seems to correspond to a class of tempting thoughts, and perhaps also to a part of our nature that produces such thoughts. The first verse summarizes in a few words the perils of our ordinary waking consciousness. Clearly we should be try to always remain on the right path of thinking and experience, the path of life. Our minds and hearts should be turned towards God. However, as is easily verified, we are continually opposed in this by three kinds of tempting or negative thoughts. Psalm 1 refers to these as (1) counsels of the ungodly, (2) the way of sinners, and (3) the seat of the scornful. Counsels of the ungodly encompass all manner of vain, useless thoughts that run through our minds: schemes, plans, vague, pointless daydreams, and the like. The way of sinners, in contrast, refers to outright sinful thoughts. And we occupy the seat of the scornful when we engage in hateful, cynical, and inappropriately critical thoughts about others and the world. These are indeed three of the most serious obstacles we face on our spiritual journey. It seems more reasonable to assume the author had a particular meaning in mind in applying the analogy of a harlot. This certainly makes sense from a psychological standpoint. 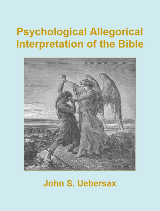 Along with the three forms of negative thinking alluded to in Psalm 1:1, sexual and sensual temptations round out a short list of the mental phenomena that psychologically assail us and against which we must maintain vigilance. The strange woman seems to refers to our concupiscent nature, or, we might say, our concupiscent nature when it is disordered. She is the part of us that is too interested in and attached to sensual and, in particular, sexual pleasure; a part of us that not only enjoys such pleasure, but craves it, desires it, and schemes to get it. Her feet go down to death; her steps take hold on hell. Lest thou shouldest ponder the path of life, her ways are moveable, that thou canst not know them. Not only does the strange woman divert us from the path of life, but she has ulterior motives. Her purpose is not really, as we might think, to obtain pleasure, but has the precise aim to divert us. This observation fits with our with our actual experience. While sensual and sexual temptations promise pleasure, in reality they offer but little pleasure followed by longer lasting displeasure. One succumbs to temptation and self- indulgence only to find that, soon after, one feels depressed, disillusioned, and disoriented. Thus, by a strictly utilitarian calculus, nothing is gained by following the suggestions of the strange woman. Her promises are deceitful, and they have a darker aim than mere pleasure. The strange woman is a close companion of the wicked man, described in Proverbs 6:12-14, who soweth discord, a figure that represents the psychic principle which works to oppose psychological integration and salvation. In Proverbs 5 the strange woman is contrasted with another female character, the wife of thy youth. Indeed, perhaps the real question to ask here is not who the strange woman is, but who the wife of thy youth is. Let thy fountains be dispersed abroad, and rivers of waters in the streets. Let them be only thine own, and not strangers’ with thee. To drink waters from thine own cistern means to be mentally guided by the true inspirations which flow from God. This goes along with what Psalm 1 describes as following the path of life and with taking delight in the law or guidance of God. The temptations of the strange woman are likened to water that comes from a different, foreign cistern — one that we should not draw from. The wife of thy youth could be understood in various ways. One interpretation is suggested by the analysis of Genesis 2 by the great exegete, Philo of Alexandria, which many Church Fathers followed. By this view, Eve, or the female aspect of human nature, corresponds to our feeling or sensual nature. She contrasts with Adam, who represents our intellective nature. The wife of thy youth, then, would correspond to our Eve “nature” before the fall — a companion, friend, and helpmate to our intellect. Our feelings and sensory nature — and by extension the body itself — are, if they are pure and properly ordered to support our relationship with God, helpful and a source of genuine enjoyment. Our body, in short, is a gift from God, to be enjoyed and used properly. The wife of thy youth can also be interpreted as Wisdom, or the part of the psyche from which Wisdom springs. Another interpretation is suggested by modern depth psychology. In Jungian psychology, positive female images — which would include the wife of thy youth, correspond to what Jung termed the anima. Like many terms in Jungian psychology, it’s difficult to define the anima precisely, but the term encompassss various aspects of the psyche which, like a mother or female friend, help, support, nurture, and guide the ego. The wife of thy youth, then, would correspond to certain unconscious aspects of the personality which inspire, guide, and help the ego. In a more general sense, we might say that the wife of thy youth corresponds to the virginal innocence of ones youth, lost, but recoverable. She represents an element of our personality that we knew in our youth, that delighted us, took care of us, and satisfied our need for companionship. A child takes delight simply in being alive, in the thrill and joy of existence, and in learning, discovering, and knowing. Concerning people, a child enjoys simply being with another human being; of making another smile or laugh; of engaging another in play or games; in learning or teaching something. The contrast between the strange woman and the wife of thy youth presents a choice between two kinds pleasures. On the one hand are the gross, dull, and ephemeral sensual pleasures offered by the strange woman. On the other are pure, eternal, and transcendent pleasures offered by the wife of thy youth — things like spiritual joy, wisdom, and virtue. The latter are the fruits of Eden and the jewels that adorn the heavenly city and the crown of victory. Clearly we should prefer these to sensual pleasures. The strange woman offers only inferior pleasures, and leads us away from the path of life, the path by which we may obtain the truer and better pleasures which God in His great love desires for us.